Kuan Yin, the third and outermost planet of the star 11 Leonis Minoris A, orbits its primary at an average distance of 0.82 AU. Upon discovery, it was classified as a Terran Hestian world; its only native inhabitants upon human colonization were ocean-going single-celled lifeforms, some of which are responsible for the planet's oxygen-nitrogen atmosphere. Surface gravity is 88 percent of Earth. The atmospheric pressure near sea level is 2.1 bars, requiring a significant adjustment for people from Earth. Carbon dioxide, in particular, reaches potentially hazardous levels at lower altitudes, necessitating use of a rebreather during extended exposure below certain altitudes. The planet's surface is wealthy in life-assisting minerals like potassium, calcium and phosphorous, and Earth plants generally grow well there. The crust also has abundant thorium; the planet's significant tectonic activity is credited to the long half-life of this slightly radioactive element. Kuan Yin has two natural satellites, Long Nu and Shan Tsai, and a faint dust ring thought to be a remnant of a smaller moon that crashed into the planet perhaps two billion years ago. Meteors striking the surface are not uncommon, although few members of the ring are large enough to be a hazard to entire population centers. However, Kuan Yin lies perilously close to a thin asteroid belt orbiting at an average of 1.09 AU from the A star. There is evidence of occasional, significant asteroid strikes in the planet's recent history, and China keeps two orbit guard vessels on station to divert any inbound masses. The planet is said to have only two seasons: hot and hotter, and there are long-term habitability and climate concerns given the Cub (11 Leonis Minoris B) is only now approaching apastron. The planet has minimal glaciation; indeed, only its far northern and southern regions are cool enough to be habitable year-round. Fortunately, of the planet's five continents, four reside within those regions. It is theorized that the planet's fast rotation (a Kuan Yin day is 16 hours long) has drawn the continental plates toward the poles. The planet was settled first by Chinese colonists in 2123. Most live on or around the east coast of Fengsheng, a large mountainous continent in the northern hemisphere. The chief city is Sizhou. 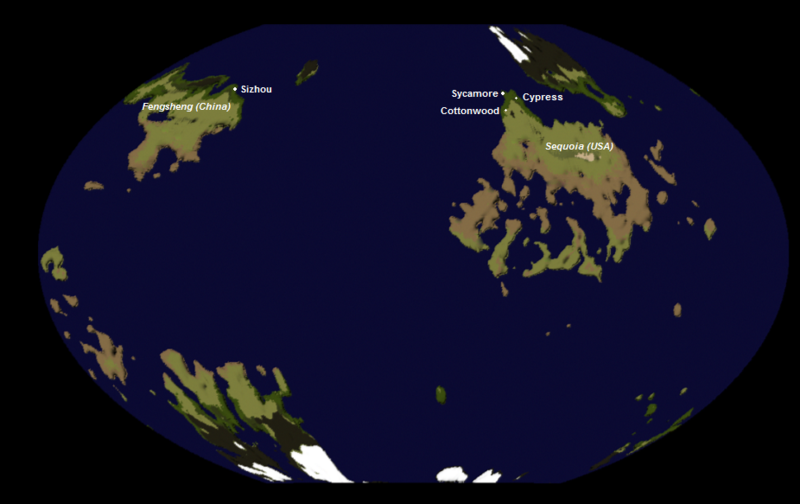 American settlement began in 2127 on Sequoia, a smaller continent in the northern hemisphere. The largest settlements or Sycamore, the territorial capital, Cypress, Cottonwood, and Runneroak. As of 2138, the planetary population is estimated at 800,000, with three quarters of them Chinese nationals. Both the United States and China are engaging in extensive terraforming of the planet. Both countries also maintain a relatively large military presence on the planet. Two refueling stations are in orbit, one operated by China and the other for the United States by Simmons D&H Incorporated. After the United States joined Japan in the war with China and Korea, the U.S. and Chinese spacefleets over Kuan Yin engaged in the First Battle of Kuan Yin in October 2139. The victorious Chinese forces then invaded Sequoia continent, defeating the U.S. 9th Division and occupying the major settlements. Surviving U.S. military forces engaged in a guerilla campaign against the Chinese occupiers. In January 2140, in the Second Battle of Kuan Yin, an allied task force under the flagship Eagle attempted to retake the planet, but it was repulsed by the Chinese fleet.